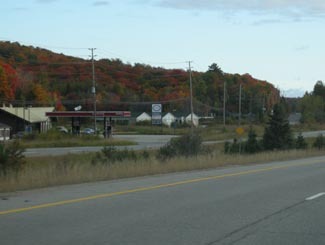 Highway 11 winds through Muskoka, Ontario’s cottage country. London, Paris, Berlin, Rome, Philadelphia, Tokyo, Johannesburg, Moscow, and Barrie. 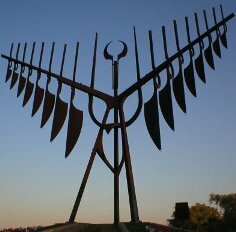 How does Barrie fit into a list of world class international cities? 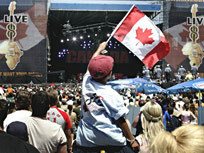 Barrie hosted Canada’s Live 8 concert at Molson Park, when Toronto couldn’t handle the last minute capacity due to other festivals and events. And Barrie was sufficiently far enough away from the Big Smoke that putting “Toronto” down on the list would have been misleading. That must have felt good, Barrie. Real good. Barrie is a suburban community of about 150 000 135 000 (175 000 if you count the greater area) that has the potential to be the next Brampton. For the geographically challenged, or very narrow-minded, Barrie is considered the start of northern Ontario. But for everyone else on the planet, it’s completely clear that Barrie is in southern Ontario. So they’re at a bit of a crossroads. 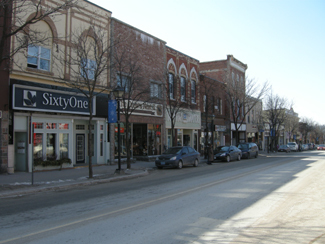 Barrie is also where Yonge Street ends and the real Highway 11 begins on its route across Ontario. Barrie used to be a farming, industrial, and brewery town. But they developed much of the land and Molson’s closed up its operations so now Barrie is a regional centre and a suburb for those who work in Toronto’s suburbs or who are willing to do the commute all the way into the big city. This means that while it used to have more in common with towns like Sarnia or Stratford, some might say it now has more in common with Brampton. 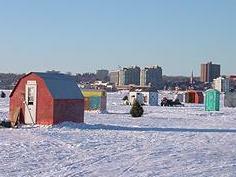 Barrie is Canada’s fastest growing city, at a whopping 25 percent between 2000 and 2005. Highway 400 to Toronto is congested, busy, and used above capacity. This is especially true during cottage season and on long weekends. So be warned. While they say it only takes 50 minutes to go from Toronto to Barrie it’s usually about an hour and a half. Barrie has commuter train service via the GO Network, but if I recall correctly the station isn’t downtown. The government has introduced legislation to keep a belt of land between Toronto and Barrie essentially undeveloped, it is very likely that sprawl will simply hop this area, called the “greenbelt”, and continue to develop it on both sides. Barrie also gained international notoriety for having one of Canada’s largest drug busts. Someone had converted part of the old Molson’s brewery into a secret pot operation and it apparently flourished until getting busted. Everyone was really surprised. To me, a product of the southern Ontario suburbs, Barrie isn’t particularly different…it is a lot like home. Its population is large enough to give you some stuff to do. The Barrie Colts are the local junior hockey team. There are two ski hills in the area (Blue Mountain and Horseshoe Valley), and there are many beaches on Lake Simcoe. 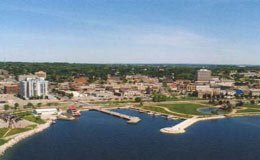 Barrie has a nice waterfront along Kempenfelt Bay, with boating, swimming, and other recreational opportunities. 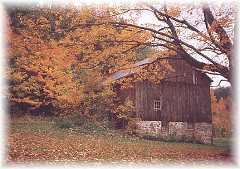 There are many cottages nearby as Lake Simcoe is a cottagey area. 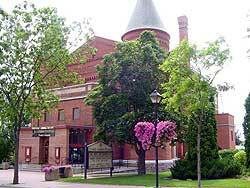 For those who like Art there is the Maclaren Art Centre and the annual Kempenfelt Arts Festival. The Downtown offers good waterfront access, a fish and chip shop, and a few nice walks along Lake Simcoe. And there is a Pita Pit. Any town with a Pita Pit gets points from me. Barrie has made an effort to keep its downtown alive despite the box stores and these new outdoor mall plaza things that have taken over outskirts of every suburban city these days, including their own. Like any other city of this size, there are the usual indoor attractions, including miniputt, movies, and bowling. Orillia is an interesting town. A bit of a mix of blue-collar rural town-dwellers, working-class provincial employees, and left-leaning urban-escapee folkies, Orillia is a strange brew – the kind of place where you’ll see a lineup at both the spelt-flour bread stall and the Dairy Queen. Imagine Guelph without the university. My first substantial visit to Orillia came in March. And I must say, even in the drab, dreary days that aren’t quite winter but aren’t quite spring, I was pretty impressed. Orillia has enacted by-laws to try to keep its downtown quaint and small-towny. And they’ve succeeded. Downtown Orillia is pretty cute. There are many independent and specialty stores. We visited a specialty kid clothier. A store that sold upscale pet accessories. Apple Annie’s bakery and breakfast that sold french desserts alongside pancakes and waffles. Hudson’s kitchen store that sold everything from fancy La Creuset enameled cookware to cat-themed soap dishes, where I finally found myself a plastic thing to help scoop chopped and diced vegetables. The main street was pretty full, for a good three blocks. I can only imagine that it is cuter, busier, and even nicer in the summer. Home of the Ontario Provincial Police, Orillia is a town of 32 000 people about 45 minutes north of Barrie on Highway 11. One hundred and thirty five kilometres north of Toronto, Orillia has waterfront on both Lakes Couchiching and Simcoe. 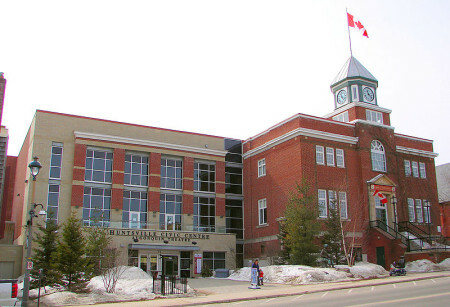 Home to the Stephen Leacock Museum, the Orillia Opera House, and the Orillia Museum of Art and History, Orillia also has a nice waterfront park with a boat launch, walking trails, and a boardwalk. The Orillia Opera House is a pretty impressive building. With two turrets, it stands out in downtown Orillia, and is pretty much unmissable. The Orillia Opera House hosts plays, concerts, and even comedy. In the back, the Opera House hosts a farmer’s market every Saturday morning, that runs through winter (we bought some jam.) The morning we were there, there were about five older men and women standing outside the opera house, protesting against war. For no particular reason, as far as I could tell, except that it seemed like something they probably did every Saturday morning since they moved there in the 1960s. Wrapped in wollen blankets, ready with pamphlets, rainbow flags, and thermoses, these grown-old hippies showed pure dedication, even if they were small in numbers. 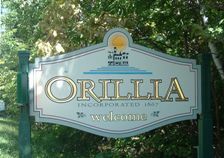 Orillia is well known for the Mariposa Folk Festival and less well known for its annual perch fishing derby. 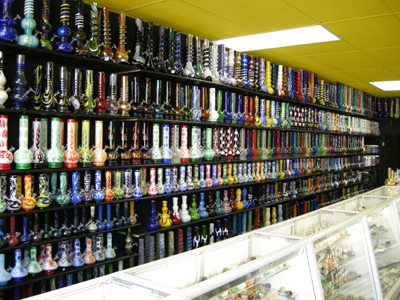 There is also a store across from the Opera House that sells bongs, and only bongs. I know that Orillia has the leftover hippie element from its folk music days, but a store specializing in selling technicolour, skull-and-crossbones, flaming ninja bongs? The woman in the store was nice enough to let me take a photo. And this is only one half of the store. Other than Opera, hippies, folk music and maybe the bong store, Orillia is also known for is Weber’s Hamburgers. 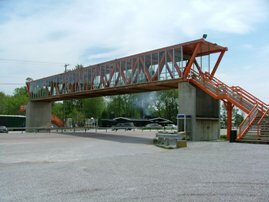 This place is so popular that it built its own pedestrian overpass over Highway 11. Sometimes the lineup stretches over Highway 11. This is a popular stopping spot for people on their way to cottage country. I’ve heard of many people who swear by their burgers but with a big lineup and a Harvey’s in Orillia, I’ve never stopped. I’m guessing this bong store serves the folk music crowd more than the opera crowd in Orillia, Ontario. They told me that people come from as far as Huntsville and that I wasn’t the first to ask to take a photo. Kashshe Lake is a small cottage community a bit to the east of Highway 11 south of Muskoka Falls about 25 minutes north of Orillia. Kahshe Lake began as a series of logging camps in the 1860s. A guy named James Grant soon built a sawmill near the lake and others followed, eventually building a hotel and a general store. However James Grant died and the rest fell into disrepair. Kahshe Lake was then abandoned and eventually become a cottage community. There two ideas of what “Kahshe” means. Some think it came from an Aboriginal word Kah-she-she-bog-a-mog, which, according to one source, means Lake of Many Ducks and Birds. Others think that Kahshe means healings waters. The lake itself is “Tea Coloured”, due to a high level of dissolved organics and is said to have healing properties. Kahshe Lake Barrens Conservation Reserve is home to numerous provincially and nationally rare plant and animal species. It is ecologically significant because of its large size and lack of habitat fragmentation. I’ve always just passed it by when driving Highway 11 but one spring I took a mid-day drive up to explore. 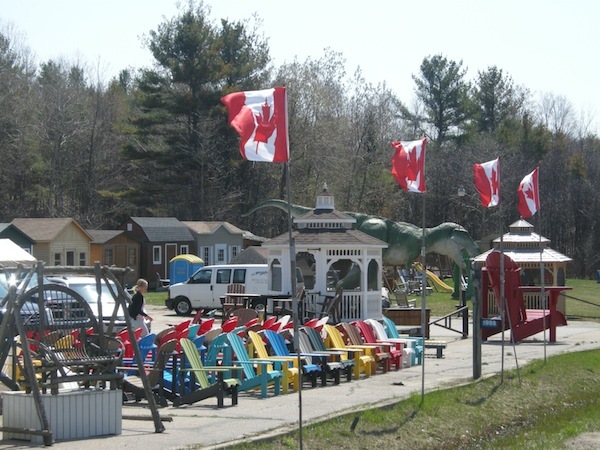 There wasn’t much beyond the usual-yet-random highway-facing stores of a cottage country thoroughfare, like an RV dealer, an inflatables repair service, and a store that sells Muskoka chairs and carved wooden bears. Most notable was the Symington Township pioneer cemetery and the really cool solar nursery setup that one of the local greenhouses has on the east side of Highway 11. North Kahshe Lake road passes through some year-round houses, ending at a small private marina. South Kahshe Lake road leads to a small cottage community whose main road peters out into a single-lane gravel path adorned with beware of flood signs. I didn’t go past that point, though I did stop to enjoy the absolute silence – bullfrogs, bulrushes, leaves, the wind – just five minutes from a bustling, 120-kilometre per hour highway. Severn Bridge was named after the Severn River, which divides England and Wales and is criss-crossed by many bridges. It is on the Severn-Trent Waterway that connects the Trent River to Georgian Bay via the Severn. Severn Bridge was founded in the mid 1800s as a logging camp. From there it developed: the post office came in 1861, the railway in the 1870s, and Highway 11 in 1927. Today it is a town of about 300 half way between Orillia and Gravenhurst. 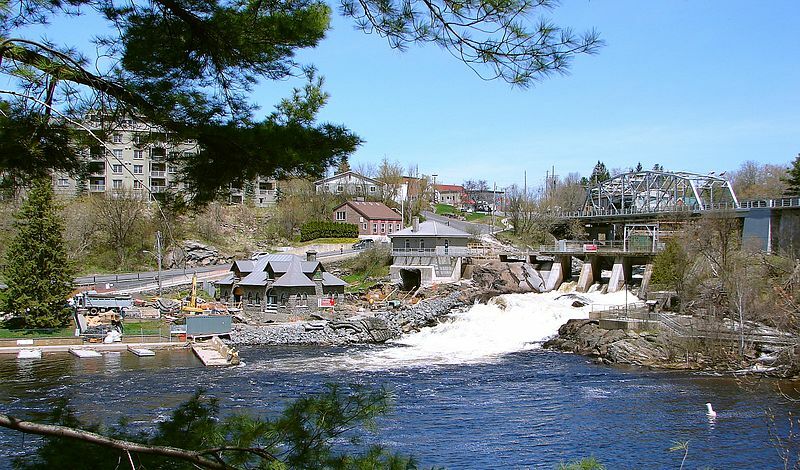 There is a small hydroelectric dam and otherwise it’s all about cottage country tourism. And bird breeding. Cute but tiny Severn Bridge is one of the first highway-side towns you north of the Lake Simcoe strip of Highway 11 just outside of Orillia. Severn Bridge straddles Highway 11, with the Rowing Club and the boat dock and the Shamrock Bay Marina east of the highway and the town proper, including a local potter, an independent gas station, two auto repair shops, an old community centre, a really nice elementary school, and an agricultural society on the east side. Close by there is the Muskoka Wildlife Centre which offers education programs for kids. Severn Bridge has two bed and breakfasts (Sparrow’s Nest and Severn Shores) and hosts an annual fall fair at the agricultural society grounds. 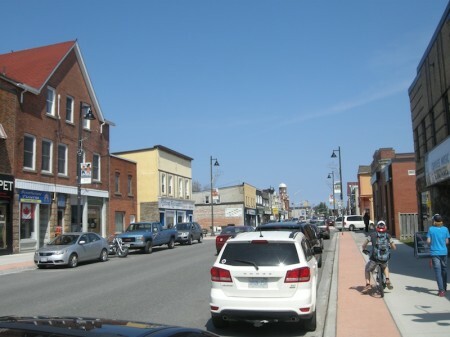 If you’re coming up Yonge Street / Highway 11 from the south, Gravenhurst is the first real town north of Orillia. And Gravenhurst is one of the first towns to truly straddle the northern-southern divide. Being in cottage country, Gravenhurst is home to all sorts of little things you’d not find in a northern town – a tea shop, two independent cafés, an upscale pub, a resort restaurant. 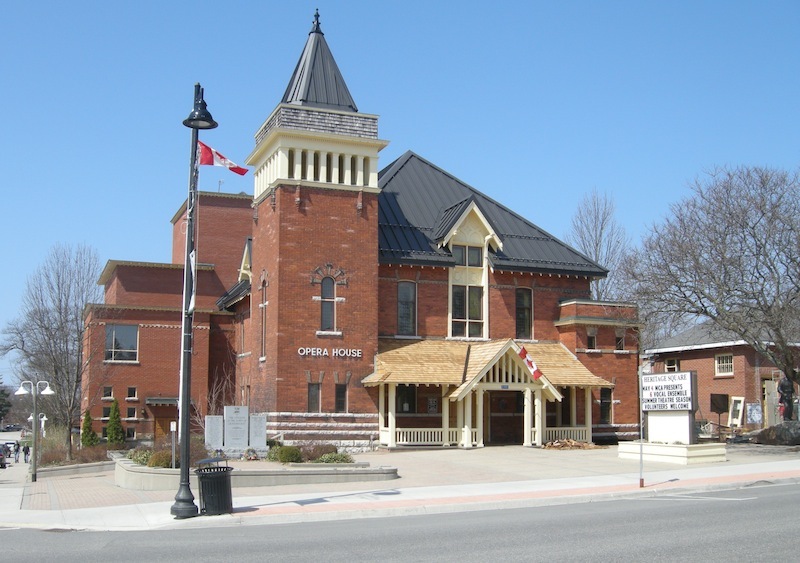 There is a small arts community – the downtown is littered with murals – and there is even the Gravenhurst Opera House, built in 1901. The Muskoka Gallery By the Bay displays art near Gravenhurst’s cute waterfront. The town hosts an annual Music on the Barge festival at Gull Lake Park, with many musicians playing in a picturesque setting. But you can tell that there’s a bit of north in this town too. It’s evident in the nature statues and the goofy motels and that one of its best-rated restaurants is a truck-stop. It’s in the tacky miniputts and the ageing tourist traps and the way a community that essentially hugs a single main road tries to brand itself into two distinct districts (Downtown vs. Uptown). And it is in the local restaurant rivalries that split long-time residents – the stone hearth knotty-pine rustic welcome of the China House versus the more run-down but all-day dim sum of the Rickshaw, and the Greek-Canadian combo at the Uptown Diner pitted against the Greek-Canadian-Italian of Rombo’s Family Restaurant. And I’m a little bit rock and roll – It’s not every Highway 11 town that has an Opera House and a statue of a communist doctor – Gravenhurst is still a bit southern, too. 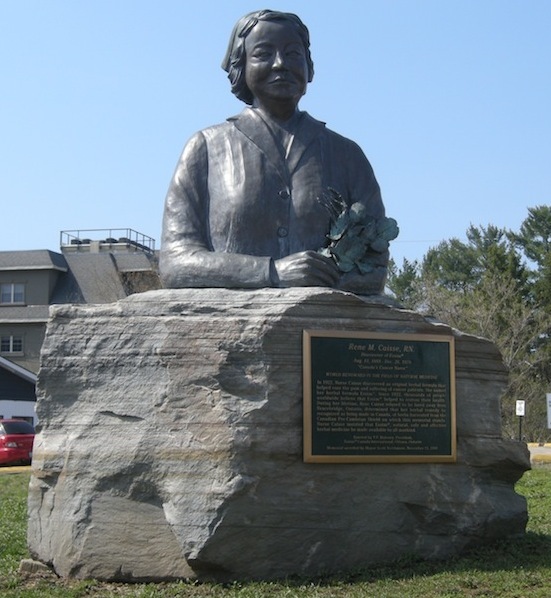 Gravenhurst was named after a village in England which is mentioned in Washington Irving’s book Bracebridge Hall. Between 1940 and 1943 it was known as “Little Norway” due to its proximity to the Norwegian Air Force’s temporary training base in Canada. Today Gravenhurst is a retirement and cottage community. 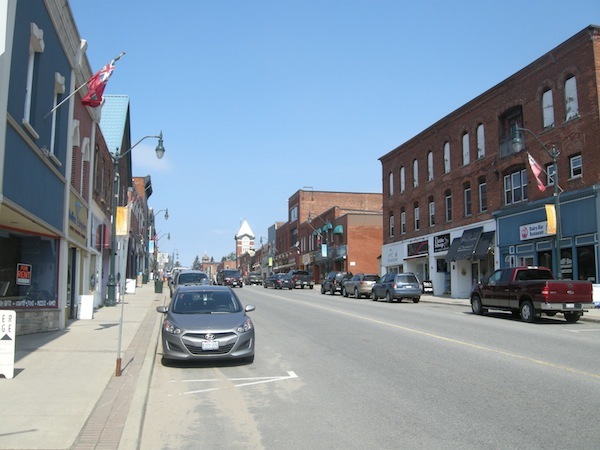 With a permanent population of 10 000, Gravenhurst is the smallest of the towns that make up the cottage country triangle (Bracebridge and Huntsville being larger) but it is still big enough and touristy enough to have the main food and lodging franchises, as well as other tourist amenities. Muskoka steamships operate three different ships that give tours of the many picturesque lakes in the area, with dinner and music cruises available. But what struck me most about Gravenhurst was the pace. Cars sauntering down the road, none hitting more than maybe 30 kilometres an hour. Moms chatting along the main street, enjoying a sundrenched May weekday before their kids get released from school in six weeks. A young family resting in the shadow of the statue of Dr. Norman Bethune, likely oblivious to the fact that he’s the only westerner to have a statue in China (and probably the only communist to have a statue on Yonge Street) taking in the fresh air whilst retrieving the shoes that their toddler had kicked off. Local kids out for lunch, meandering in their flip flops having jumped at the chance to wear summer clothing in the decidedly spring weather, full of the listlessness of near-freedom in the face of limited opportunity brings after a tiring, cold winter. Everyone enjoying the space that becomes so competed-for once the cottagers come in, yet likely all-too-aware that none of this would be possible without the annual invasion of busy and bustling out-of-towners that trample this vibe for twelve weeks each and every year. More Adirondack oops I mean Muskoka chairs on Highway 11…and another inexplicable Yonge Street / Highway 11 dinosaur sighting. I never actually meant to visit Bracebridge. I was heading for Muskoka Falls when I had my head turned by a highway sign advertising a McDonald’s, a Harvey’s and a Subway just a couple of kilometres from my intended destination. I didn’t need food – I had a sandwich packed from home. I didn’t need coffee – I’d already had one extra large one-cream-two-sugar and one small one-cream-two-sugar from Tim Horton’s. I didn’t need anything sweet – I was saving that treat for a milkshake somewhere along the way back. But I really had to pee. 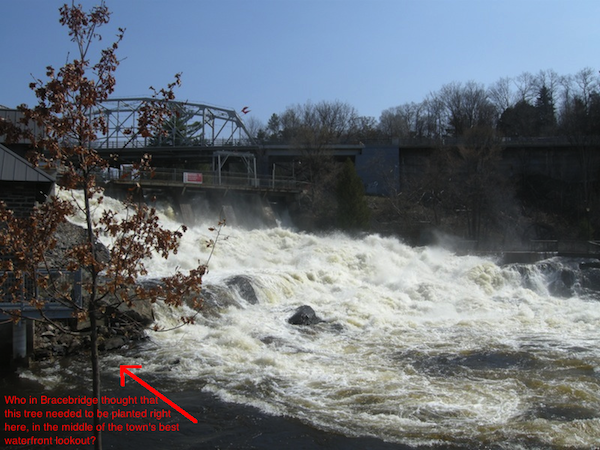 So instead of turning right to Muskoka Falls I turned left, following the instructions of the sign. I’m sure it really didn’t take as long as it felt, but when you have to pee as bad as that kid in the Robert Munsch book, one minute feels like 10. I followed a winding road through old farm land, a short bit of bush, past a cement plant, past a conveyor belt factory. I don’t know what I might have missed or where I missed it, but I never saw another sign for any of those fast food joints. I passed dinosaur, and a strangely placed totem pole and statue of a nurse, until I was faced by Marty’s World Famous restaurant, an ice cream parlour, and a couple of stores that sold cottagey stuff. Somehow I had ended up on Manitoba Street. I was smack-dab in the cutesy cottage country downtown of Bracebridge. Bracebridge is a town of 13 000 right smack dab in the middle of cottage country. It is one of the three main towns of Muskoka, the other two being Gravenhurst and Huntsville. It is not directly on Highway 11 – just a smidge west of it. Named after the book Bracebridge Hall by Washington Irving. I believe the local postmaster was reading it at the time the town was to be named. 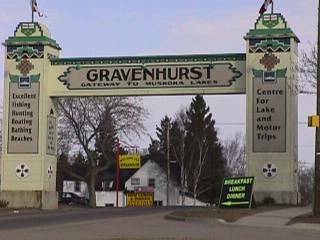 Gravenhurst also had the same postmaster, and was also named after something in the same book. 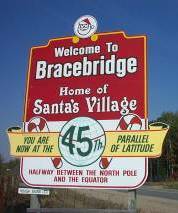 Bracebridge is exactly halfway between the equator and the North Pole. 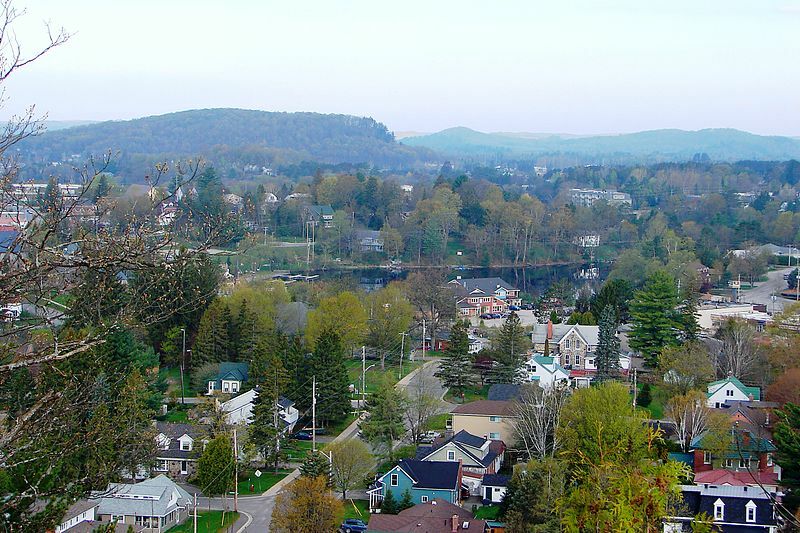 Bracebridge was founded on the backs of a number of different industries, including furs, agriculture, brewing, logging, milling, and hydroelectricity. In fact, Bracebridge was the first town in Ontario to have its own hydroelectric generation due to North Falls (see the falls tour). There is still some hydro generation, and there is still a brewery too. Being a tourist town, Bracebridge is relatively full of places to eat, drink, and sleep and have fun. You’ll have no problem finding accommodation. I mean, book ahead of course (especially during the summer!) and don’t just show up expecting to find something. But you don’t need me to tell you where to go in cottage country because places abound. The main tourist attraction in Bracebridde, aside from cottages, is Santa’s Village. I have a friend who is 37 years old and he can’t stop telling me how magical it is. Whatever. Maybe because it is relatively cheap. He also likes that it’s in off the highway and in the bush. It’s low key and kid oriented, but supposedly inexpensive and not too touristy. And it’s full of men with bad beards, if you’re into that kinda thing. Bracebridge is home to Woodchester Villa, one of the finest octagonal houses in Canada. As well, Guha’s Lions and Tigers is a little lion and tiger zoo in Bracebridge and is another one for the kids to see. There is also golf, boating, art, parks, cottaging, camping, snowmobiling, a water park, a movie theatre, a little film festival put on by the highschool, and the Festival of the Falls which celebrates the 22 waterfalls within Bracebridge’s fairly expansive town limits (one of them is even referred to as the north’s Niagara Falls – someone should tell that to Kakabeka.) I arrived in town about a month after the floods of 2013 – which shut down Highway 11 in a few spots – and the waterfalls were still running high. Bracebridge has all of the hallmarks of rural/northern Ontario touristiness – the tacky shops, the hokey Canadiana, and big weird random big things for the kids. 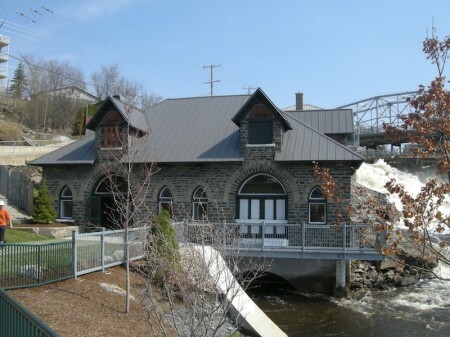 On my last visit, volunteers were repainting Bracebridge’s old hydro station – it’s going to be a town museum. This tree location makes no sense. Come on Bracebridge! Way to ruin a great photo spot. So this Ontario Public Health sign was up in the washroom of the visitor’s centre, where I parked in Bracebridge. And I got to reading it. Does anyone truly wash their hands for a full 15 seconds? This was news to me. 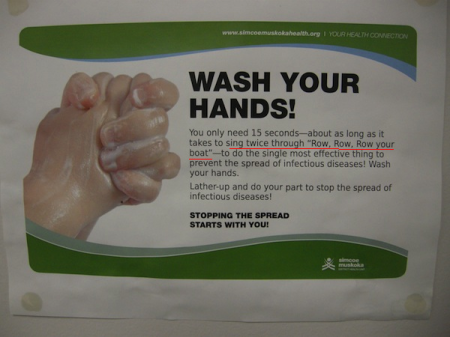 So I followed their advice – and proceeded to thoroughly wash my hands … only to be interrupted by a knock on the washroom door. The staff attendant wanted to check on me to see if I was alright – apparently I had been mindlessly singing “Row Row Row Your Boat” just a little too loudly. Sometimes I think I’m really bad at being away from home. 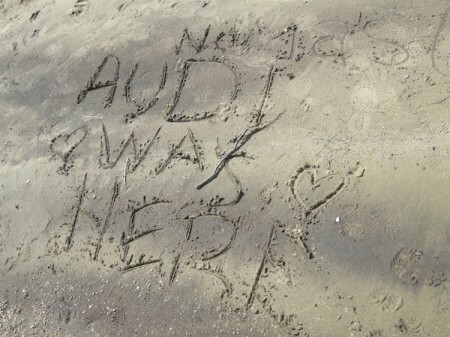 Despite having a travel blog, I’m actually not much of a traveller. But despite being not much of a traveller, the number of opportunities I’ve squandered while being out of town are embarrassing. I once turned down the chance to hike a mountain in Grand Teton National Park because I was too lazy to pack a lunch. I once passed on a hands-on biologist’s tour of state-of-the-art cattle grazing practices, based on the traditional grazing practices of buffalo, in Montana because I was sore from an hour’s horse ride. I missed out on what will probably be a once-in-a-lifetime the chance to visit my grandmother’s original hometown near Budapest because I was too worried about whether the cabbies in Hungary would know enough English to get me from the airport to the city, so I opted to go to more English-speaking Sweden instead. I bailed early from a hell-raising American Legion singles party in Massachusetts because, well, ok it wasn’t just me – me and my friends we were young, from Canada, and all got a little nervous at the potential prospect of being further hit on by some really strange people. I didn’t get to visit the Idaho Potato Museum because I was hell-bent on getting a milkshake from a Salt Lake City fast food place I’d seen on TV. It turned out it was closed on Sundays. OK, so maybe that last one wasn’t the biggest missed opportunity in the world. But anyway, you’d never expect it, but Port Sydney is also one of these times. 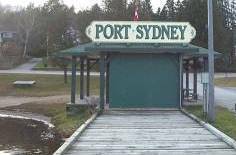 Port Sydney is a small little town about 20 minutes south of Huntsville. 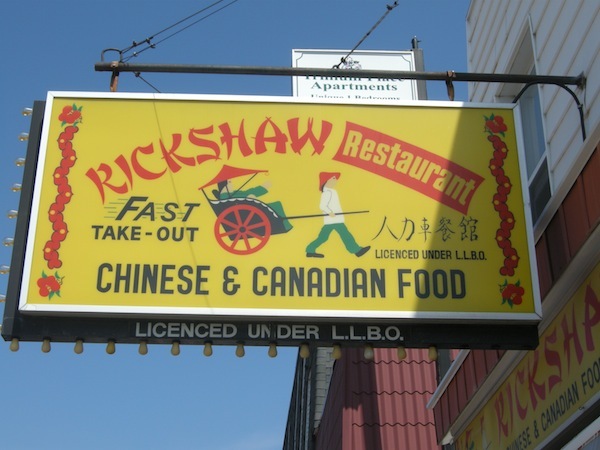 It isn’t on Highway 11, but I’ve included it because it’s close, and I once got lost looking for the Huntsville Swiss Chalet and ended up in Port Sydney instead. Yeah. I got really really lost. I’d promised my companion one restaurant meal in exchange for her agreeing to spend a valuable long-weekend day-hiking the Opeongo Trail. And I’d been to the Swiss Chalet once before – seeking refuge from a bad biology trip in university with some other non-nature-inclined suburban students. So I figured I knew where it was: one exit south of Huntsville of Highway 11. Not so. And after two hours of driving backroad after backroad, u-turn and u-turn, detour after flailing detour, I ended up on a tidy road that hugged a small lake. People were everywhere. The street was packed. Boats were on the water, kids in it. Kids were lining up for games. Parents were milling about in sandals holding ice cream, sausages, roast corn, beer. We were in the middle of nowhere and people were everywhere. I’m pretty sure there were fireworks planned off in the distance. Someone was motioning me to pull over. “You can park up the hill a bit” he mentioned when I lowered my window. He was surprised to see me inch on through. “Got plans tonight then?” he said, or something to that effect. He waved for me to move up into the parking but I just kept going forward, slowly, saying nothing. Eventually he cleared a path of kids and I continued on my way. It was Port Sydney’s annual festival. Too nervous to be found out as a non-cottager, I passed it up to go to Swiss Chalet instead. 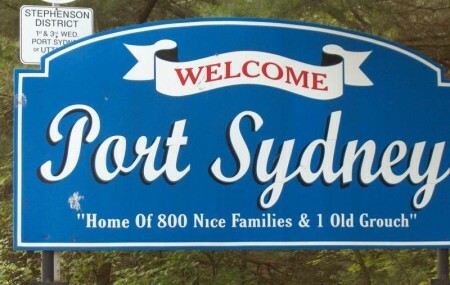 The Port Sydney area has been settled since 1861. Albert Sydney Smith founded the town ten years later when he took over an abandoned mill and a dam. A plan for the village was created and it grew with the logging industry, until the railroad decided to bypass the town for Utterson. Logging then dwindled in importance and the tourist trade took over. Port Sydney is really quite cute and is situated on a nice bit of waterfront along Mary Lake. 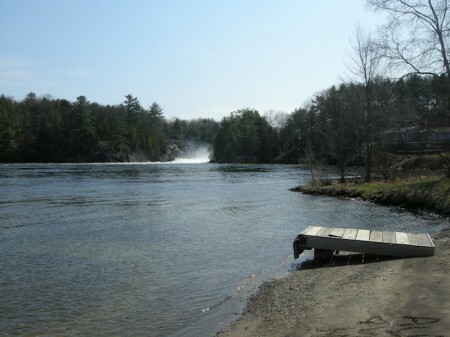 There is a dam nearby, rapids, and the beach in town is the largest in the Muskoka area. There are bed and breakfasts and lodges in and around Port Sydney. 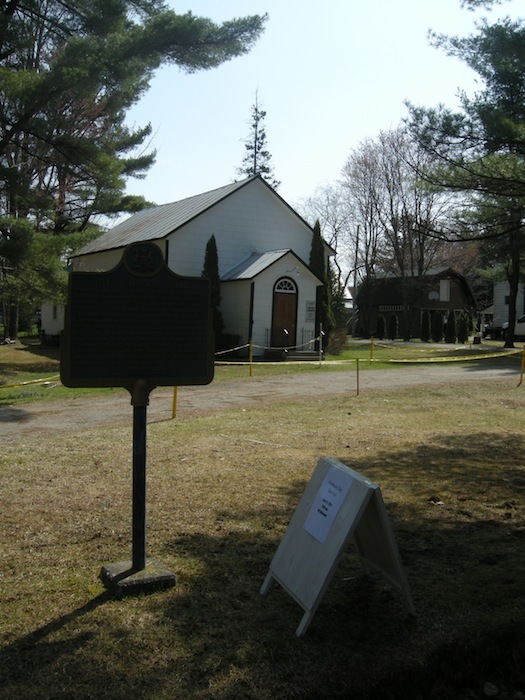 Port Sydney also had the oldest church in Muskoka until it was recently destroyed by arson. A new church has been built in its place and there is a plaque commemorating the old one. At the junction of highway 141 and old Muskoka Road, Utterson is just west of Highway 11 and not far from either Port Sydney or Huntsville. Utterson was a stop on the old Canadian National Railway, and pretty much made nearby Port Sydney switch from lumber to tourism after the railway passed it by. I’ve been to Huntsville at least four times, if not five. Yet nothing really rings a bell. I once bought a flask though at the Northern General Store on the main drag right across from the Pita Pit. Another time I had an extra pickles veggie pita too. I once used a pita from the same Pita Pit to convince the local Beer Store (or was it LCBO?) to stay open an extra five minutes. I’ve been to the bank in Huntsville. I got super ridiculously lost trying to find the Swiss Chalet in Huntsville. But…most of my memories are of Algonquin. I think that pretty much sums up my activities in Huntsville. 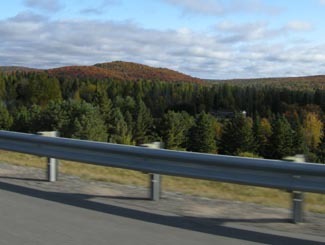 Huntsville is the last real town on Highway 11 before North Bay and is also the last major centre in Muskoka cottage country. Huntsville is an important cottage and camping area, boosted by two fancy resorts, close access to Arrowhead and Oxtongue Lake Provincial Parks, and the busiest access point to Algonquin Provincial Park. Huntsville is pretty cute. There’s a nice little winding downtown (that reminds me a bit of Kirkland Lake, but nicer) that skirts around the lake, and the town is very much cottage country magnet full of stores and services both useful and tacky. Huntsville hosts an annual arts festival. The town is home the Muskoka Museum, an art gallery, and the new Algonquin Arts Theatre which produces plays during cottage season. There is also an annual book reading festival, the Firefly Festival in July, and a summer car show. Founded in 1869 as an agricultural post, Huntsville today is a town of 18 000 focused on tourism, cottaging, and a bit of manufacturing. 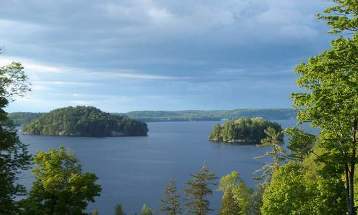 Algonquin Provincial Park is about 60 kilometres east and that means that there are numerous lodges, inns, motels, and outfitters in and outside of the city. The Wolf Den Bunkhouse, about 30 minutes east in Dwight, is a great little hostel with cottages as well as single rooms in a neat log house. In addition to a Pita Pit, Huntsville has a Harvey’s, an East Side Mario’s, a Swiss Chalet, and a movie theatre. Huntsville also has two top notch resorts – Hidden Valley and Deerhurst, the latter being where Shania Twain got her start. There is train (not twain) and bus access from the ONTC, and Huntsville is the proud owner of a one-route municipal bus system. Highway 11 is littered with B-list motels near Huntsville that look empty and forlorn in the off-season. But in tourist season, they sure fill-up. 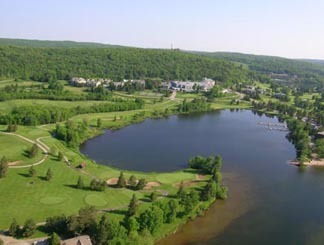 Deerhurst Resort. Obviously not my photo.